The UnRules presents the dynamic rules for success in the age of exponential information. Written by Igor Tulchinsky, the trader behind global quantitative investment management firm WorldQuant, this book is more than just another Big Data guide for financial wonks — it’s a prescriptive, inspirational book for everyone navigating the tidal waves of the information age. Data is everywhere, coming at us in a never-ceasing, ever-rising river that threatens to overwhelm us. Tulchinsky shows us, however, how natural patterns underlie that data—patterns that may dictate life or death, success or failure. The marriage of man and machines has allowed scientists to explore increasingly complex worlds, to predict outcomes and eventualities. This book demonstrates how to exercise real intelligence by discerning the patterns that surround us every day and how to leverage this information into success in the workplace and beyond. Igor Tulchinsky has spent his career discerning meaningful patterns in information. For decades, Tulchinsky has been at the forefront of developing predictive trading algorithms known as alphas —a quest that has led Tulchinsky to explore the nature of markets, the fundamentals of risk and reward, and the science behind complex nonlinear systems. 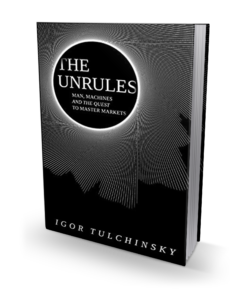 Tulchinsky explains what we know of these systems, both natural and man-made, in accessible and personal terms, and he shares how alphas have driven his success as an investor and shaped his central “UnRule,” which is that no rule applies in every case. As markets evolve, even the most effective trading algorithms weaken over time. Decades of creating successful alphas—and learning how to effectively transform them into strategies—have taught Tulchinsky about the need to combine flexibility and focus, discipline and creativity when building complex models. At a time when data and computing power are exploding exponentially, The UnRules provides an expert introduction to our increasingly quantitative world. Igor Tulchinsky left the Soviet Union for America with his family and a suitcase. 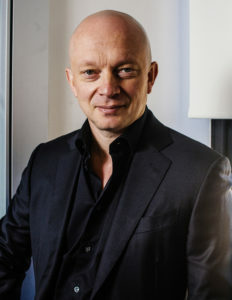 Today, he’s running a leading global quantitative investment management firm, WorldQuant. Along the way, Tulchinsky developed early video games, wrote software at Bell Labs, and mastered quantitative, computer-driven in­vesting.